Interesting to see its serving Lee Mill and Smithalee unlike the Citybus 45. It is unknown if this new service will result in the 180 being cutback. It looks like its due to start 7th October. I guess we can expect fares to match Citybus too. The outcome in Ivybridge will be determined by reliability and fares (for non-concessionary pass holders). FD&C have a very poor reputation in Ivybridge for punctuality, particularly on westbound service X80 journeys to Plymouth – many Ivybridge residents try to use the infrequent Stagecoach South West service X38 (Exeter – Plymouth) which has a good reputation for reliability. I think First had to retaliate here or else they would be letting Citybus walk all over them...it will also send a warning shot should Citybus have any plans for further expansion over First territory. I notice that First 88 is generally 5 mins or so ahead of Citybus 45 enableing First to pick up the majority of single fares in either direction ?? A good competitive move!! Nice to see a token couple of evening services which along with the X80 should give some kind of service here at night..something that Citybus have not bothered with. I wish First would extend their evening services on their Plymouth routes as well. I also think First should look for new corridors, 2 ideal ones I feel would be Eggbuckland, Crownhill, Mutley, City as Citybus service is poor in Eggbuckland and perhaps West Park, Transit way, Crownhill, Mutley, City to cover for dwindling Citybus service along Crownhill Road. Personally I would also bring back Woolwell service, number 85 every 30 mins thus eliminating the need for Tavilynx to divert to Woolwell. Citybus are surely going to win on vehicle type, presentation and consistency, though. What will First use? A mix of elderly Darts in various colours? I imagine some of the Ivybridge residents referred to as using the X38 do so because the buses are better. Definitely agree with you there; it seems as the 45 will come off the 43A it'll have the B7RLEs which may well win passengers over. Something very exciting is coming to Plymouth Citybus - 1st September! Those secondhand buses we're expecting? The final timetables? New livery? Will be interesting to see what it is. Of course First are five minutes in front they put their service out as a response to Citybus, that was bound to happen. The buses actually arrive in Plymouth within a ouple of minutes but Citybus arrives on Royal Parade where passengers will want to alight, not in the stinking dirty bus station. I would suggest that the majority of fares from Ivybridge are returns or day tickets not singles, so quality of service will count. First have treated Ivybridge customers badly for years, now they expect loyalty? Citybus said this is a start up timetable and if the service proves popular they will look to put on more buses and run later in the evening, and wasn't the service planned to link through to Saltash giving many more destinations for Ivybridge passengers? I suppose that will happen with the October changes. I wish Citybus good luck. The move that First have made by running their services 5 minutes earlier is a very competitive move, will be interesting to see who wins the battle! MOBILE TICKETING IS COMING TO PLYMOUTH - As of 1st September 2012 you will be able to buy selected Citybus tickets via our new smart phone app! Keep an eye out for more details coming soon! from wot i heard first never unregistered the service 88? New livery finally released. Looks like a minor refresh of the Stenning livery more than anything. They say all plain red buses have been painted into this livery, with presumably more to come! I do like the plain red as the base livery, to me it looks really smart. Why oh why the white curve that goes over the windows. To my eyes it looks absolutely awful and ruins what otherwise is a good livery. Please can windows be kept for looking out of and not used for these sorts of unnecessary embellishment. Agree, that white curve does spoil it a bit and makes it look rather odd, and just doesn't fit it. It should look okay on the Darts, though it really doesn't suit the Enviro's curves. Why does Waterslade Drive have an hourly service *from* Plymouth, but nothing in the other direction? It's good to see First fighting back. It's a positive sign that they mean to stick around in Plymouth. The city needs First pitching up and fighting for territory. Once we know the exact shape of PCBs new routes from October I would expect to see another move from First. On the basis of what PCB look to be bringing out in October I think the return of the 12 to Chaddlewood would be a good move along with strengthening in Estover and a new route for Eggbuckland. 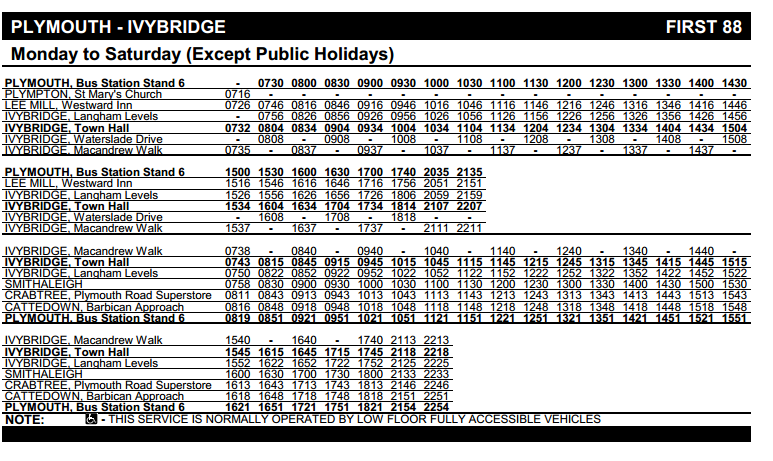 This First timetable looks more useful to residents in Ivybridge than PCBs offering. The route looks to serve Ivybridges western suburb and serves Cole Lane. I agree that it is good to see First fighting their corner on the Ivybridge run. Dont forget though that the 15 was originally every 15 mins and it has been First that have cut back to what it is now, along will culling almost all their extra Ugo routes so I wouldnt hold your breath for them to increase Plymouth services to fight Citybus. It is nice to see the P&R buses back but you cant read anymore into that - First can and do move their buses out to another area at the drop of a hat. Remember all those nice Wright bodied Volovs we had when First wanted to compete against Citybus? I hope I am wrong - I want to see First make an effort and compete back against Citybus, but I am not convinced they have the fight in them.